Students, faculty, and staff have a new space to pray on campus thanks to the recently built St. Michael Chapel in Maloney Hall. The altar for the new chapel was consecrated by the Most Rev. 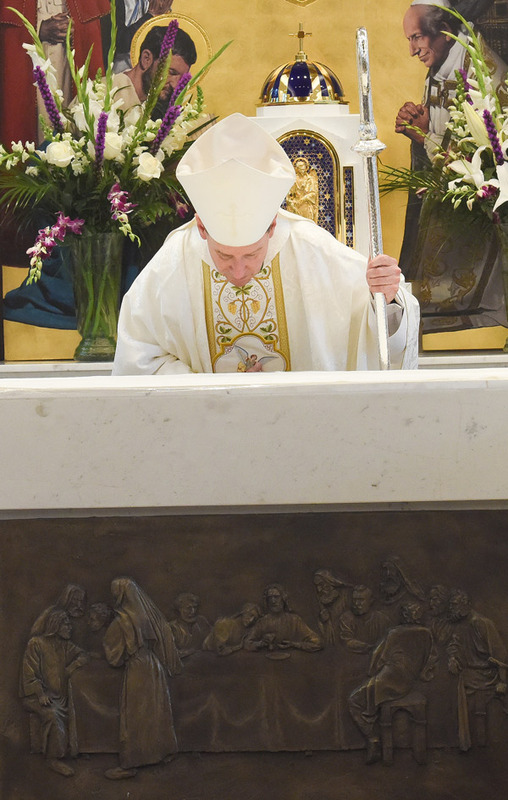 Michael F. Burbidge, Bishop of Arlington, Va., during a Mass on March 18. The Mass was celebrated before a room filled with University leaders and board members, while students and faculty participated via livestream from a satellite location in Maloney Hall’s Della Ratta Auditorium. 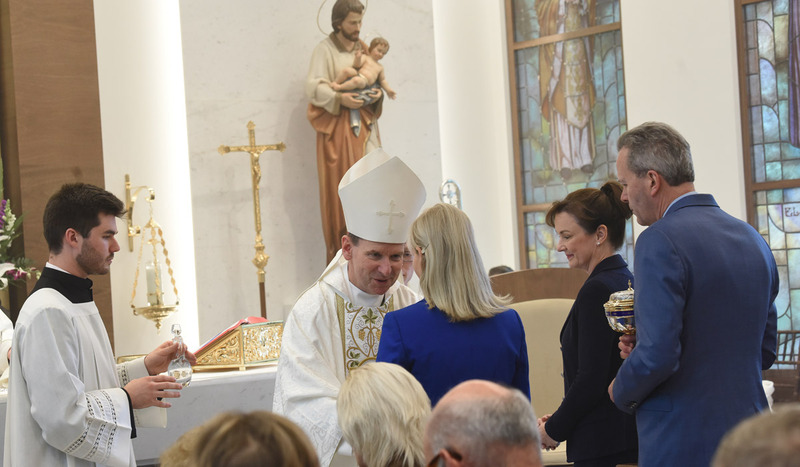 “The dedication of the altar provides all of us, dear friends, with an opportunity to rededicate ourselves, our work, and our studies to the Lord, remembering our ultimate purpose to give glory to God and to serve one another, especially those in need,” he said. The bishop also thanked Tim and Steph Busch and the many other donors involved in the Maloney Hall renovations. Following the homily, the bishop led those present in a litany of the saints before completing the rites of anointing, incensing, covering, and lighting the altar. Each of those actions are intended to signify the many invisible ways God works through the Church’s sacraments. Following the Mass, Bill Bowman, a professor of business and former dean of the Busch School, said the consecration ceremony was a kind of fulfillment for Maloney Hall, which was under construction for two years (after being closed in 2015) before reopening to business students, faculty, and staff this semester. In addition to the chapel, Maloney Hall is now home to an array of high-tech classrooms, team study rooms, and office spaces. Katie Watson, a current M.S.B.A. student, said she appreciated the symbolism of the chapel’s location, nearly right in the center of the building. Designed to reflect the teachings of Catholic social doctrine, the St. Michael Chapel features original artwork by artists in Spain. 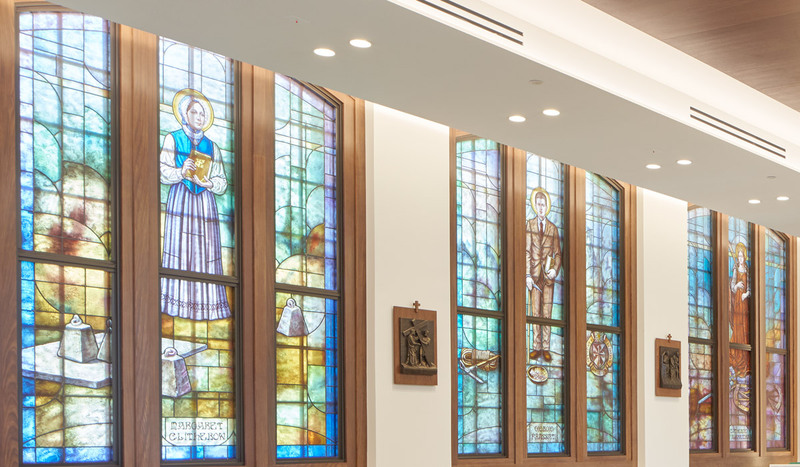 Nine stained glass windows depict saints and holy people who serve as patrons for students and businessmen and women, including Catherine of Alexandria, Enrique Shaw, Pier Giorgio Frassati, Margaret Clitherow, Gregory the Great, Josemaría Escrivá, Elizabeth Ann Seton, Thomas Aquinas, Katharine Drexel, and Maximilian Kolbe. 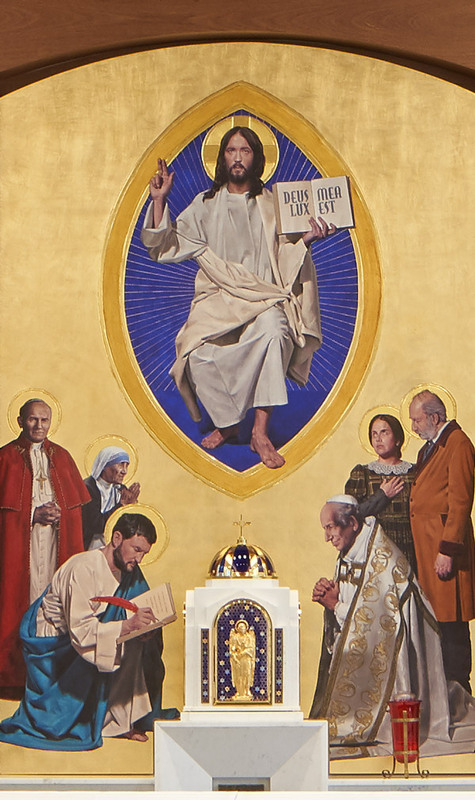 Other art features include an altar panel of Christ in Heaven surrounded by Pope Leo XIII, founder of Catholic University, and saints representing the four pillars of Catholic Social Doctrine: Matthew the Evangelist for the common good; John Paul II for solidarity; Teresa of Calcutta for human dignity; and Louis and Zélie Martin for subsidiarity. Just below the panel sits the chapel’s tabernacle: a one-of-a-kind scale model of the Basilica of the National Shrine of the Immaculate Conception.